Raindrops and Daydreams: I love targeted advertising! 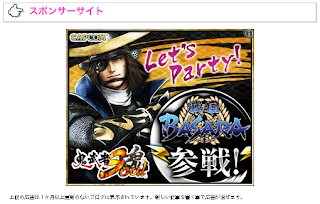 Nothing makes looking up an unfamiliar word more satisfying than a dictionary website with Masamune's face staring back at me from the top of the page. Of course, it's only a simple advertisement for the ongoing Onimusha Soul tie-in campaign. Onimusha Soul is a browser game which I've never been tempted to play but nevertheless I fully approve of their marketing techniques. It's distressing when I visit British websites with their mundane banners promoting nappies and perfumes. Edit: Another one, this time on a Japanese blog website. I'll avoid making separate posts for every single advert I discover.